We Built This Company on Rock and Roll. We’d hate to give any more airtime to Starship’s Built This City, the song VH1 labeled the worst rock and roll song ever, but We Built This Company on Rock and Roll. In the beginning, over 30 years ago, it was all about the music…in a time when Jefferson Airplane ruled the airwaves; just two brothers selling records out of the back of a van. And so The Exchange was born in Cleveland, Ohio - now home to the Rock and Roll Hall of Fame. year since the days of our first mobile store, albeit the back of a conversion van, to over 20 locations in Ohio and Pennsylvania and new franchises opening soon in Toledo and Chicago. Given our humble beginning, we're also very proud of our many local opinion awards, including Best Record Store, Best Indie Record Store, Best Place to Buy Used Video Games and Best Place to Buy Used CDs. Guess you could say, "we're all grown up." 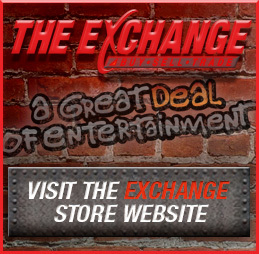 It was our love for business, not music, music, that drove us to launch The Exchange Franchise System in 2006 to allow entrepreneurs, small business owners, and entertainment lovers to have the opportunity to build their own company.